So I've been blowing glass for the last....say....three years or so...and I havent put any of it onto my website, until NOW! Check out the new glass section! 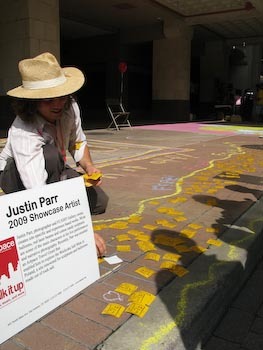 I had a great time this last week participating in Artpace's Chalk it Up event, on Houston Street in San Antonio. 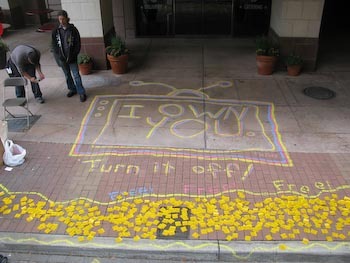 I screened 6000 "I OWN YOU, Turn It Off!" television stickers at my studio and handed them out to hordes of kids & adults in a matter of hours. I've been screening these stickers and giving them out since the first days of FL!GHT Gallery, when we used to be located in old grain silos behind the Blue Star. My work has come a long way since 2002, but this remains to be one my projects that has made the most impact. A book out of Germany documenting the worldwide sticker subculture will be printing a few images of my turnitoff-tv this year, as well there is a healthy underground network of people who consistently send SASE's to FL!GHT Gallery to be filled up with stickers and mailed back to them. Heres a few photos of my chalk rendition of my old scrawl. Aaron Forland told me today that a haircut is going to change his life. I haven't cut my own hair since August 1 of last year. My next haircut will be self-inflicted, and in a remote place. I look forward to it. I just got an email letting me know that the show I was recently in at the Houston Center for Photography/fotofest venues, "Viewfinder," is traveling to the Dallas Contemporary. 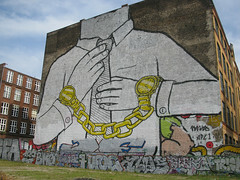 The tentative schedule has it up from March 12, 2009 until the end of May. I'll put up more information as I find out. Whoo! I'm having fun nesting categories within categories.. hang onto your seats! new works and new understanding. ..like Ben said, its not really broken. but , it is in process. and its all here for you.